Dee Brown has plenty to celebrate after Wednesday’s 103-83 victory over Lietuvos Rytas Vilnius. The CSU Asesoft Ploiesti guard not only led his team to its biggest win in competition history, the club’s best start to a Eurocup season and a share of first place in Group E, but his brilliant individual performance, which was 1 assist shy of tying an all-time Eurocup record, netted Brown Eurocup Regular Season Round 2 MVP honors. Brown sparkled with 18 points, 14 assists and 3 steals. He shot 4 of 8 from downtown and also hauled in 4 rebounds in amassing a performance index rating of 33, which was the high-water mark for any player in the competition’s 18 Round 2 games. Brown had stiff competition for the weekly top spot. Anthony King of Artland Dragons Quakenbrueck and Strasbourg’s Antoine Diot each tallied index ratings of 32. King went for 22 points, 9 rebounds, 4 assists and a block as Dragons edged Cantu 77-78 on the road. Diot led Strasbourg to an 88-86 victory over CAI Zaragoza with 26 points, 5 rebounds and 8 assists. 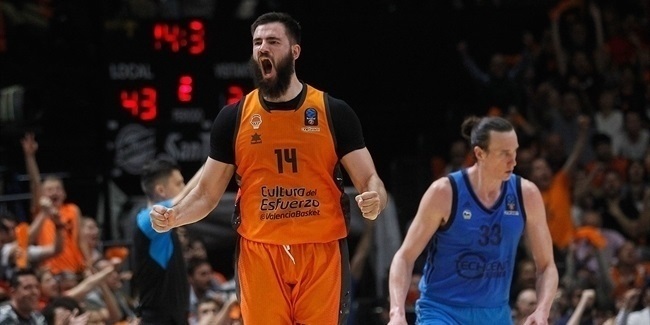 Rounding out the list of the week’s best were three players with 29 indexes: Tyrese Rice of Khimki Moscow Region and Brose Baskets Bamberg teammates Ryan Thompson and Brad Wanamaker. Rice produced 22 points and 5 assists for Khimki in its 85-88 road win at Union Olimpija Ljubljana. Bamberg blasted Telekom Bonn 104-79 as Thompson produced 22 points with just 3 missed shots and Wanamaker racked up 16 points, 10 assists and 5 steals. Chris Lofton of Besiktas Integral Forex Istanbul scored 32 points to lead all Round 2 scorers in an 86-90 road win against Zenit St. Petersburg. With an average of 24.5 points per game, he also sits atop the season’s scoring charts. His teammate JaJuan Johnson hauled in 12 rebounds to top that chart for Round 2. He is ranked second for the season in rebounds per game with 10 per game, trailing only Bamberg’s Trevor Mbakwe and his 11.5 per game. Johnson also swatted 4 shots to make himself the week’s best shot blocker. Mirza Begic of Union Olimpija Ljubljana is averaging 4 blocks per game to lead all players. Dee Brown is the No. 1 assist man for the week and the season with 10 per game. 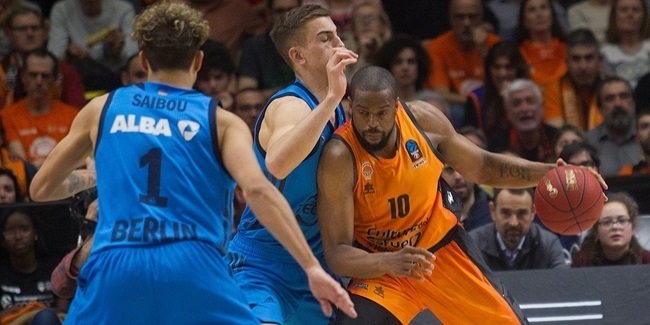 Wanamaker and Strasbourg’s Louis Campbell each had 5 steals, which were the most in Round 2. 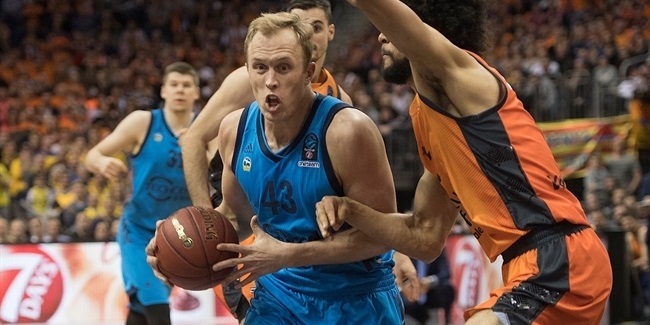 Three players – Besiktas’s Johnson, Tyler Honeycutt of Khimki and Mindaugas Lukauskis of Lietuvos Rytas – share the season-long lead with 3.5 steals per game. Eleven players recorded double doubles in Round 2. Brown, Bernard King (16 points, 10 assists) of Krasny Oktyabr and Wanamaker did so in points and assists. Johnson (21 points, 12 rebounds), Matt Howard (19 points, 10 rebounds) of Strasbourg, Dylan Page (18 points, 10 rebounds) of Proximus Spirou Charleroi, Anthony Randolph (17 points, 10 rebounds) of Lokomotiv Kuban Krasnodar, Sharrrod Ford (15 points, 11 rebounds) of Paros Levallois, Adam Chubb (14 points, 11 rebounds) of EWE Baskets Oldenburg, Randal Falker (12 points, 10 rebounds) of Sluc Nancy and Donte Smith (10 points, 11 rebounds) of Hapoel Jerusalem complete the list.